For those looking for a no frills repress, there is a scorpio records pressing now floating around..better than paying inflated prices..
A superb session. I do prefer the stereo mix over the mono mix, though. Most Blue Notes from this era and before sound better in mono in my honest opinion, but this particular record sounds best in stereo. The session is on fire, and you imagine yourself somewhere in the middle east, accompanied by belly dancers and camels. A masterpiece. Basra is a classic mid-60s jazz album by a young and dynamic drummer. The LP never slows down. The mood is mystic, moody. 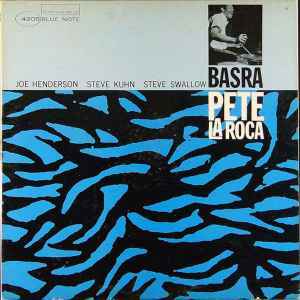 Everyone - Joe Henderson, tenor sax; Steve Swallow, bass and Steve Kuhn, piano - have robust tone and rhythm. The improvisation is so much better than most of what I hear today. This is a classic album I've enjoyed for 50 years. As usual Rudy Van Gelder gets that up close immediate sound. This album is a stone cold classic that was never repeated, totally amazing from start to finish. Joe Henderson and Pete La Roca redefine what can be achieved musically on the track Basra you may wonder if the saxophone is playing Joe Henderson and not the other way around and then you get Pete La Roca's drum solo [outstanding], Malaguena is played to standards not heard before making it a tour de force, but that's just the hard hitting tracks when the group play melodies and harmonize on the rest of the album, On Lazy afternoon you become aware of the breath taking beauty of the pictures these players depict, please do yourself a favour and listen carefully because very few albums were ever made like this.